The other day I fed my shopping bug and picked out the cutest little tea pot at Teavana, comparable to a Toys“R”Us for tea lovers. 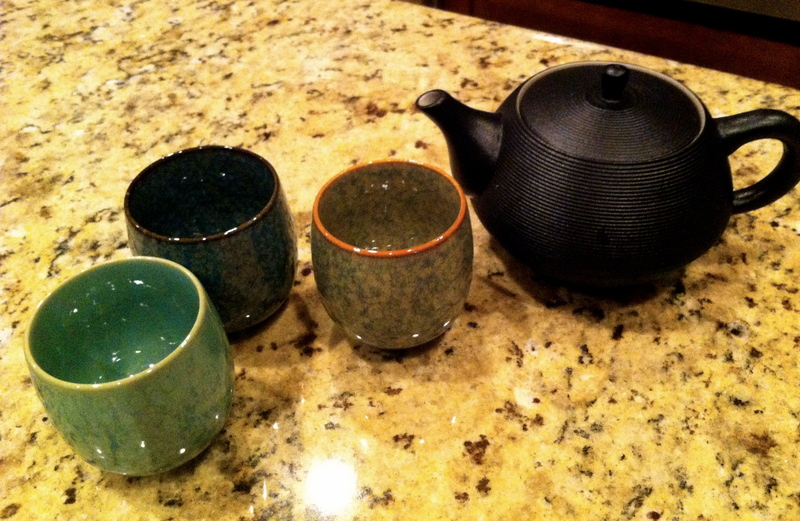 We’ve all heard the health benefits of tea rattled off to us at one point or another so I finally caved and bought into the craze…and am I ever glad I did! Not only did I buy an adorable tea pot that makes me feel equipped to serve tea to Queen Elizabeth, but I also purchased some equally adorable tea cups, hidden gems that happened to be on sale. Score! I was so thrilled to steep my first batch of Gyokuro Genmaicha Green Tea blended with Acai Matetini Mate Tea for added flavor that I failed to realize the art of making tea. That’s right, I said there is an art to making tea. And if you don’t practice this art, you can wind up with some super bitter tea and a feeling of disappointment (if you were as excited as I was). It turns out, there are five main types of tea: black, white, green, oolong, and pu-erh (pronounced wu-long and poo-air respectively), and each is like a different genre of art, producing different yet equally as amazing finished products. It also turns out that if you steep green tea for too long in too hot of water, it tastes bitter and awful. Lesson learned. This is probably why most people don’t enjoy the taste of green tea, which is one of the best tea’s for antioxidants and cancer fighting properties. GREEN TEA: 165-175º F (77-82º C) 1-2 minutes. As mentioned above, green teas can become especially bitter if you use too hot of water or steep for too long. The same goes for white teas. Never use boiling water for these teas. This is because boiling water actually cooks the tealeaves, which destroys the flavor. 1. Start with cold purified water and bring it to a rolling boil. 2. Take the water off the heat and allow it to cool for approximately 30-60 seconds. This is about how long it takes for boiling water to reach the desired temperature of 165-175º. 3. Finally, pour your water over your desired amount of tealeaves, let steep for the appropriate time, take tealeaves out of pot and enjoy! WHITE TEA: 165-175º F (71-77º C) 90 seconds – 2 minutes. The brewing guidelines for white tea are virtually identical to those of green tea. BLACK TEA: 190-200º F (88-93º C) 3-5 minutes. Black tea is equivalent to Oolong tea in its brewing procedure. 1. Start with cold purified water and bring it to a light boil for about 1 minute. When the small bubbles start to reach the top of the water, this is about the appropriate temperature to remove from heat. 2. Pour water over your desired amount of tealeaves, let steep for the appropriate time, take tealeaves out of pot and enjoy! OOLONG TEA: 180-200º F (82-92º C) 90 seconds – 2 minutes. The brewing guidelines for Oolong tea are virtually identical to those of green tea. Pu-erh, is actually an aged tea originated from China and is known for its distinct taste. This tea is like a nice red wine high in tannins, it only gets better with age. Pu-erh also has a slightly more complicated brewing method. 1. Bring 6-8 ounces of cold purified water to a rolling boil. 2. Pour boiling water over tealeaves for approximately 10-20 seconds, then pour the water off the leaves. This removes any impurities and allows the leaves to open. 3. Bring another 6-8 ounces of water to a boil and this time pour over tealeaves for approximately 30-60 seconds. *Because Pu-erh tea doesn’t really become bitter if steeped too long, you may steep it for as long as you want based on your desired intensity. The longer the brew, the stronger, fuller, and sometimes sweeter the tea will become. Now I know what you’re thinking, “This blog rocks!” Okay, so maybe you weren’t thinking that, but now the idea is planted in your head so roll with it…Anyway, you’re probably actually thinking that tea can get somewhat expensive, can’t it? Yes and no. If you go on a tea buying rampage because you’re so eager to try all the different teas there are then yes, you can end up with a nauseous feeling and a lump in your throat when the cashier rings up your total. Is it rude to ask them to put some back? However, here’s a nifty little trick I learned to help you stretch your money. Most teas are actually re-steepable, as long as you don’t let them dry out between steepings. This means that you can brew multiple cups off a single teaspoon of tea! However, each additional steeping will most likely require a bit longer to produce the same or near to same taste. Remember, when brewing tea, the tea amount, time, and water temperature is ultimately all-dependent on your personal taste. Use these guidelines as a basic starting point then experiment to find what you like best. This entry was posted in Nutrition Facts and Tips and tagged antioxidants, brew, Diet, energy, green teas, health benefits of tea, steep, tea, weight. Bookmark the permalink.